Toronto's Yonge and Eglinton neighbourhood is rapidly changing thanks to an influx of high-end condos. These towers are bringing with them a slew of new businesses, making the area a much more desirable place to live, especially for those who don't want to settle farther downtown. 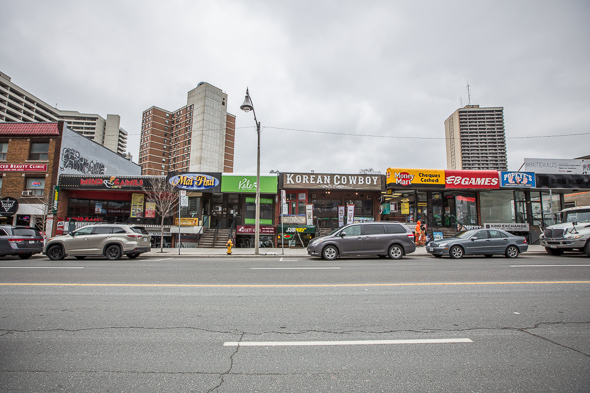 One long-standing Yonge and Eglinton strip plaza, however, will soon disappear to make way for the 29-storey Whitehaus Condominiums, which Lifetime Developments and current landlord Knightstone Capital are building. 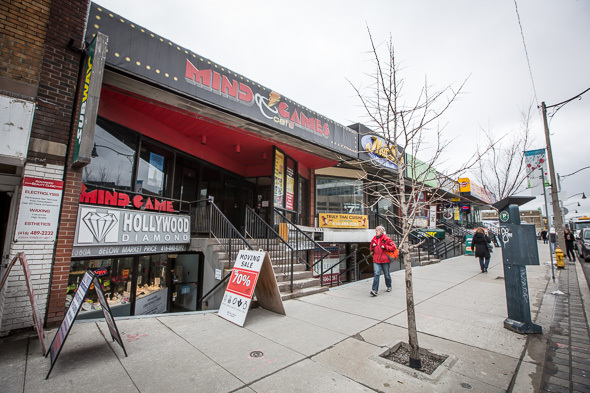 This mini-mall, at Yonge Street and Helendale Avenue, was built in the early 1980s. It's now home to a smattering of stores and restaurants, including Korean Cowboy and 28-year-old jewelry store Hollywood Diamond. Many of the former and longtime tenants, like the vegan restaurant Kale and Mai Thai, have already closed up shop. Hollywood Diamond, which has been at the same spot since 1988, will be moving across the street to 2368 Yonge Street at the end of June. Korean Cowboy will be staying open for as long as possible. "We're looking for a spot to move to," says owner Sam Lee. Tentatively, he has to move out by June 30. He's now looking for a new location, and would ideally like to move to either the Annex or North York. "We knew it was coming and the landlord's always been forthcoming about the whole deal," notes Lee, who knew he'd have to move when he signed his initial lease. The plaza looks like quite the ghost town now, despite being located near one of the city's busiest intersections; it'll be anything but come 2019. Residential units in the Whitehaus Condo are already 94 per cent sold out Lifetime Developments VP Brian Brown tells me. He says construction should start this fall. The tower will include 70,000 square feet of commercial space in a three-storey podium, though Brown can't confirm who'll be moving in just yet. "There's no information we can release on that at this stage," he says. Though it likely won't be small, locally owned stores and restaurants. Along with a concourse and three ground-floor tenants, there will likely be a restaurant - with a Yonge Street-facing terrace - on the third floor. Will you miss this Yonge and Eglinton strip plaza? Let us know in the comments.